In January, Kay Johnson traveled to Seoul, South Korea and Osaka, Japan. Sam Bo Scientific is our South Korean local distributor for biopharmaceutical and marine sciences. 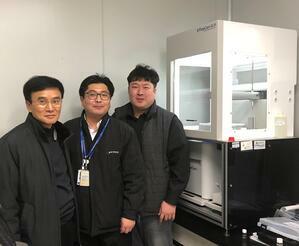 Sam Bo’s CEO Won-Kyong Kim, Sales Managers Young-Jun Seo and Min-Yeol Lee traveled with Kay to a Seoul Biopharmaceutical company and performed a FlowCam ALH installation and 2-day training. This company plans to use the FlowCam to analyze protein aggregates in drug formulations. In addition, Kay and Sam Bo Scientific visited a National Environmental Agency to present the capabilities of FlowCam technology for intended marine sciences research. from Sam Bo Scientific with the FlowCam ALH. Am Lab Inc. is our local distributor for marine sciences in Japan. Kay traveled with Hideyuki Yamamoto to Osaka, Japan for a 2-day FlowCam Training at Kanso Co., LTD, a regional engineering company. They have plans to use the FlowCam to analyze meiobenthic organisms. 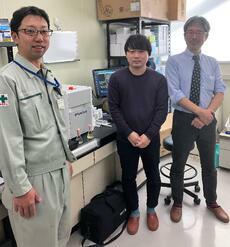 This published paper by Kitashi, et al (2018) prompted this Japanese group to purchase a FlowCam with a color camera. If you're interested in joining our team and supporting our global customers, consider a career at Fluid Imaging Technologies. View our Careers page for position openings.